A landowner, abutters, DCR and NepRWA collaborate to save one of the few unprotected endangered species habitats inside 95/128. It was a major part of the largest remaining area of unprotected endangered species habitat inside the 95/128 corridor. Two years ago, it was slated to be paved over for a 276 unit apartment complex named the Milton Mews. Today it is one of the newest additions to the Neponset River Reservation—permanently protected by the Mass Department of Conservation and Recreation (DCR). From the very beginning, a broad cross section of the community rallied together to save this unique property located on the border of Milton and Canton, by documenting the presence of the sensitive species, organizing a vigorous legal defense and rallying political support. 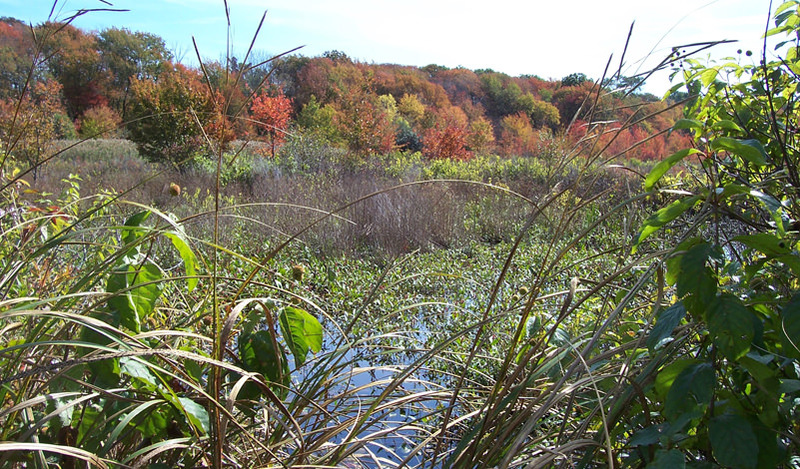 For its part, the Neponset Watershed Association (NepRWA) highlighted the unusual legal protections that applied to the site by virtue of its being included in the Fowl Meadow Area of Critical Environmental Concern, a status we secured in the 1990’s. NepRWA also helped document the breadth of public support by organizing an online petition that quickly garnered more than 1,300 signatures. Eventually strategic maneuvers by abutters broke up the group of parcels that the Milton Mews developers had assembled, making it impossible to proceed with a large scale “40b” development in and around these sensitive wetlands. In recent months, the owners of the largest parcel, containing the most sensitive habitat areas, had begun exploring options for a smaller subdivision as well as the possibility of working with DCR to protect much of the property. However, lingering hard feelings between neighbors and the property owner were a barrier to achieving a conservation outcome. NepRWA’s Executive Director Ian Cooke, jumped in to conduct shuttle diplomacy among the property owner and the neighborhood, talking with both sides separately to explore a solution that all could live with and eventually bringing all the parties and DCR to agreement on a plan that would place the most sensitive areas of the property under state ownership, and allow a limited development of two, carefully-located homes that will be surrounded by conservation restrictions. DCR Commissioner Leo Roy and the Baker Administration demonstrated a commitment to following through on protecting this unique property, even at a time of booming real estate prices when DCR has very limited resources for land acquisition. DCR’s skilled land acquisition staff led the final negotiations with the landowner to a successful conclusion. In the end though, it is the landowner who deserves most of the credit for this successful outcome, for their willingness to work with neighbors who had so recently been vigorous opponents, for coming to appreciate the ecological significance of their property, and for working with DCR to see most of it protected for future generations. An outcome like this—going from a proposal for a large scale development to a successful conservation outcome—is extraordinarily rare, and we can count the Fowl Meadow extremely lucky to have such a broad and energetic community of advocates working on its behalf. Sign Our Petition Against the Milton Mews!